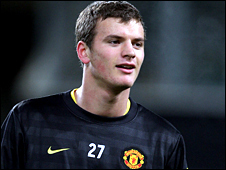 Injury-hit Manchester United have been forced to bring the son of club chief executive David Gill in as emergency cover for a mounting defensive crisis. Oliver Gill, 19, has been added to the squad for the Champions League game at German side Wolfsburg on Tuesday. It follows the news that defenders John O'Shea and Jonny Evans have been ruled out of action until January. Boss Sir Alex Ferguson said Gill would not be given special treatment, adding: "If he is good enough, he plays." United are without 12 players for the game against Wolfsburg, although the Red Devils have already qualified for the last 16 of the tournament and only need a draw to take top spot in Group B.
O'Shea and Evans were both hoping to return to action in Saturday's home Premier League game against Aston Villa following thigh and calf injuries respectively. But the club have confirmed they will not be fit until the new year, ruling them out of five Premier League matches and the Champions League game. United have eight defenders out of action, with Nemanja Vidic (flu), Rio Ferdinand (calf), Wes Brown (hamstring), Gary Neville (groin), Rafael (shoulder) and Fabio da Silva (groin) are sidelined. In addition, midfielder Owen Hargreaves and keeper Edwin van der Sar are undergoing treatment for knee injuries. And with strikers Wayne Rooney (hamstring) and Dimitar Berbatov (knee) now also doubts for the match against Aston Villa, Ferguson's squad is stretched to near breaking point. Patrice Evra is the only regular first-team defender in the squad for the trip to Wolfsburg. Ferguson could employ a makeshift centre-half pairing of midfielders Michael Carrick and Darren Fletcher as he waits for his walking wounded to return to fitness, although he is reportedly trying to convince Evra to switch to centre-half. The injury crisis could prompt a first appearance for reserve-team centre-back Gill. Ferguson is taking advantage of a rule that allows youngsters who have spent two years at a club academy to be added to the original list of 25 players United had to supply to Uefa at the start of the competition. Ferguson said nepotism would play no part in his decision over whether to play Gill, who turned professional in July. "It doesn't concern me. If he is good enough, he plays," stated Ferguson. "That is the name of the game at Manchester United. I had my own son [Darren Ferguson] in the squad for four or five years and he was treated exactly the same as any other member of the squad. It will be the same for Oliver." Privately educated at Manchester Grammar School, Gill opted against going to university in order to pursue a full-time career in football. "He's decided to take the big step forward and give it a go at professional full-time football," added Ferguson. "We admire him for that. "Over the last year or so he's started to develop physically. He was very rakish and gangly when he was growing and lacked strength but now he's starting to come together in terms of his physique and has done well. "It's also because of the injuries we have but he's doing very well." 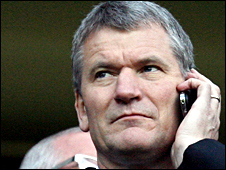 Oliver's father David Gill, 52, is an accountant who joined United as finance director in 1997 and took over as chief executive six years later following the departure of Peter Kenyon to Chelsea. On the Manchester United website , Gill junior is described as a tall and commanding central defender. "One on one he is very dogged and determined and difficult to get past," said Paul McGuinness, who coached him in United's under-18 side. 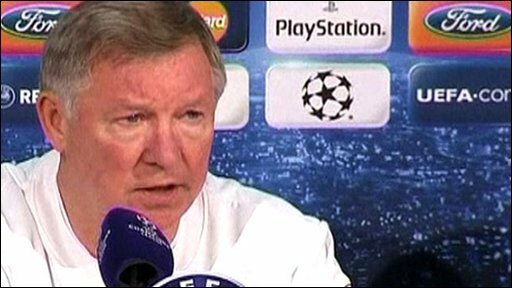 However, with United having already qualified for the knock-out stages of the Champions League, Ferguson's biggest concern is the Premier League encounter with Villa. He had hoped there would be an improvement in the situation by the weekend but while Vidic is likely to have recovered from flu by then, the outlook for Brown, who has a hamstring injury, is not as positive. "We are hoping to have Wes fit but hamstring injuries are difficult. It is not an easy one," conceded the Scot. After the Villa game, O'Shea and Evans are likely to miss matches against Wolves, Fulham, Hull and Wigan. Meanwhile, Ferguson has distanced himself from reports linking Manchester United with a January bid for Wolfsburg striker Edin Dzeko. The 23-year-old Bosnian, who has found the net 40 times in 75 Bundesliga appearances, scored Wolfsburg's goal in the German side's 2-1 defeat at Old Trafford in September. But Ferguson said: "It is an age-old story. Every time someone does well against Manchester United we are going to buy him the next day. "There is nothing from Manchester United at this moment concerning Edin Dzeko."